Based in St. Louis, Kari Hartel has been writing nutrition-related articles since 2009. Her articles have appeared in OSF Saint Francis Medical Center's "Connections" newsletter and The Cancer Center for Healthy Living's newsletter. Hartel is a registered dietitian and holds a Bachelor of Science in dietetics from Southeast Missouri State University. Iron is a mineral that is essential for human health. Your body cannot produce this micronutrient, and it must be obtained from food. Iron is required in many of the proteins and enzymes in your body that have various functions in maintaining proper health. Iron is necessary for the transport of oxygen in your blood and muscles, as it is a component of hemoglobin and myoglobin. Iron also helps regulate cell growth and differentiation and is a nutrient used in DNA synthesis. Blood transport proteins called transferrin and ceruloplasmin carry iron to all of your body's tissues, vital organs and bone marrow. This process allows your body to regulate metabolism, synthesize DNA and produce red blood cells. The average adult human body contains 3,000 to 4,000 milligrams of iron. Iron is stored mainly in your liver. Your body continually loses 1 to 2 milligrams of iron each day through urination, defecation, sweating and the sloughing off of dead skin and intestinal cells. Iron is constantly recycled as red blood cells die. Therefore, some iron can remain in your body indefinitely. Your body absorbs iron most efficiently from animal food sources of iron called heme iron. 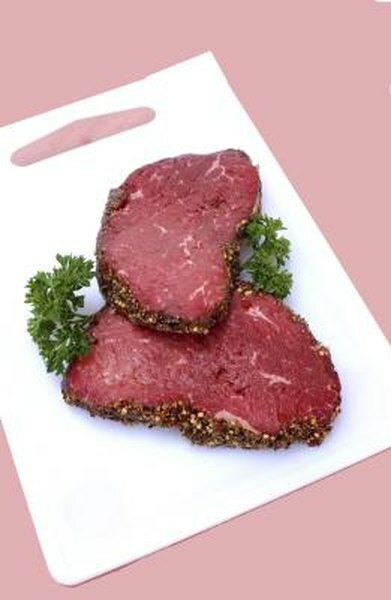 Heme iron is found in red meat, fish and poultry. Iron that is found in plant foods such as vegetables, fruits and grains is called nonheme iron, and this form of iron is not absorbed as well as heme iron. Food sources of nonheme iron include lentils, legumes, seeds, leafy green vegetables, dried fruit, tofu, whole grains and fortified cereals. The Food and Nutrition Board at the Institute of Medicine recommends a daily iron intake of 18 milligrams per day for women of age 19 to 50, and 8 milligrams per day for women of age 51 and older. Blood volume increases during pregnancy to meet the needs of the baby and placenta. Therefore, pregnant women require about 27 milligrams of iron per day, and possibly higher intake during the second and third trimesters. An iron intake of 9 milligrams per day is recommended for lactating women. Low blood iron levels over an extended period of time can cause iron deficiency anemia. Women who experience heavy periods, strict vegetarians and women with long-term inadequate dietary iron intake are at increased risk for iron deficiency anemia and may benefit from iron supplementation. Kidney problems that require routine dialysis or gastrointestinal disorders that decrease iron absorption can also cause iron deficiency. In contrast, people with a genetic disorder called hemochromatosis, which causes the body to absorb too much iron, need to follow a low-iron diet, avoid iron supplements and get their blood iron level checked periodically.